Having washed the yeast from the primary fermentation of the Barrel Project Sour Saison in April, I was keen to make another saison-like beer for the summertime. Along with being on a hop-kick, I was inspired to make a hoppy farmhouse ale of sorts. Anticipating the ultra-high attenuation of Wyeast French Saison, I designed a malt-forward grist to balance out the bitterness and late-hop character of the finished brew. 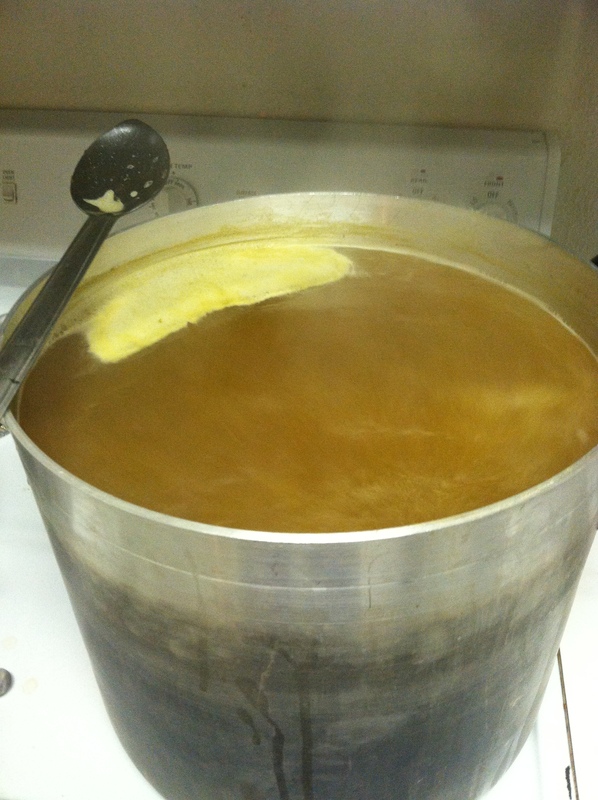 This blog post summarizes the brew day of the Farmhouse IPA. Largely, in this post, recipe design and brew day glory are discussed. Additionally, the recipe is included at the end of the post as well as some fermentation details. Cheers, and happy brewing! This recipe was initially inspired by Hoppy French Saison by Michael Tonsmeire of the Mad Fermentationist blog. Using his basic ideas, Saaz hops would make up the late additions as they pair well with the fermentation characteristics of the French Saison yeast strain. In addition, pilsner malt would comprise the majority of the grist; however, I diverge from his recipe through small additions of Munich, Carapils, Caravienne, and Melanoidin. From my brewing experience, the French Saison strain leaves the beer nearly fully attenuated (~1.002), chewing through all the malt. As a bone-dry saison, it’s quite nice; however with loads of hops, this could potentially overpower the balance of the beer. For the Farmhouse IPA, I designed a malt-forward grist knowing the malt character post fermentation will be muted. Hopefully, this grist will provide enough residual malt character to balance all those late hops. In addition, I under-bittered this IPA along the same lines as the malt concern. Consisting of only 35 IBUs, the bittering addition is quite small for a traditional AIPA. That being said, an IPA-style IBU/OG ratio is expected at > 0.70. Given the attenuation should be near 1.004 and using a gypsum-forward water profile, I expect the bitterness to be suitably enhanced. Without going into all-grain brewing techniques (that’s another post), the Farmhouse IPA is a fairly simple brew day. 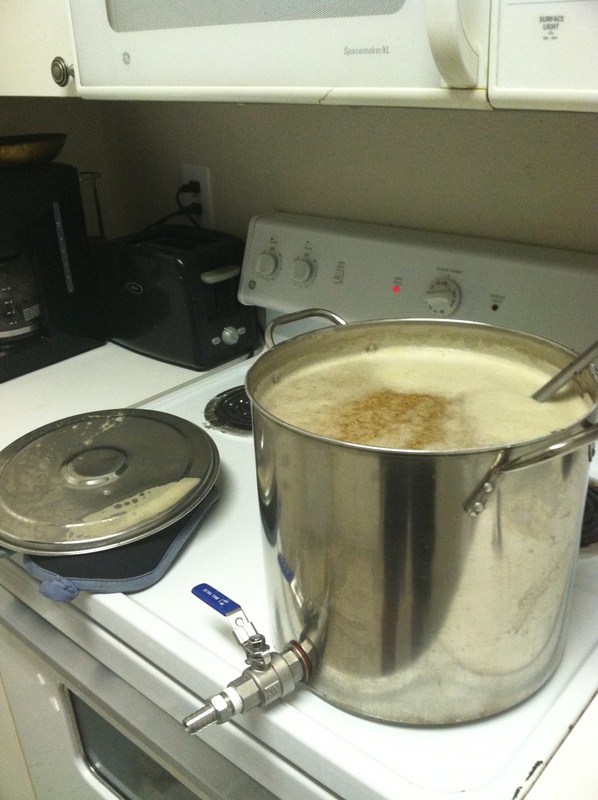 For my set-up pictured above, I used 2.5 gallons of water to mash in the ~8 lb grist. Using single-infusion, I mashed for an hour at 152 F, then rose the mash via the stove top to 170 F, and mashed out for 10 minutes. To keep the mash at temperature, I put the mash tun in the oven, and used the warm setting to keep the mash at temp! Since I have a small, 4 gallon mash tun, I need to do two, 1.5 gallon batch sparges to get my 85% efficiency, and as a result, I watch the wort run off pH closely. I recommend RO water for the sparge water if your tap water has high pH. The boil was pretty simple as well. I bring the wort up to a gentle boil, add a high-alpha hop like Magnum for bittering, and late additions of Saaz hops, adding 1 oz at 10 minutes, and 1 oz at flameout. Additionally, I added 2 oz of dry hops post primary fermentation. In lieu of the dry hops, I would push these additions at the 0 minute mark. This should get you around 35 IBUs. For apartment-based chilling, I use a water/ice bath combo, each with 5 gallons of water. Through this, I’m able to chill 5 gallons of wort from boil to 68 F in 40 minutes, and I’m happy with that. Since I harvested the yeast from a previous batch, I pitched approximately 0.75 million cells/ml/degree Plato, or 170 billion cells. A fresh smack pack will also work great as it’s a pure, lab grade culture, requiring fewer cells. 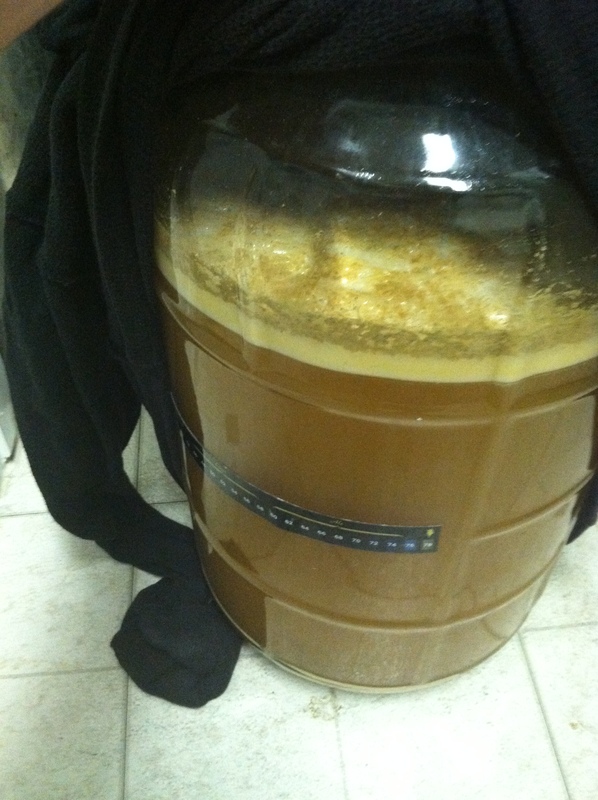 Fermentation was pretty quick, from start to finish in 10 days. When fermentation slowed, dry hops were added in the primary and sat for 5 days. I turned this batch around pretty quickly from fermentation to keg in 2 weeks. However, I let it mellow out in the keg for about a month, just to settle out the yeast and residual dry hop matter before enjoying. Tasting notes to be posted soon! Have you ever brewed a hoppy farmhouse ale, and how was it? Leave you feedback in the comment section below. Cheers, and happy brewing!